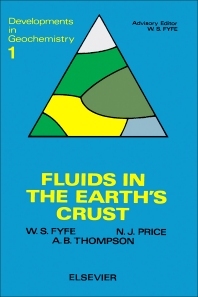 Fluids in the Earth’s Crust explores the generation and migration of fluids in the crust and their influence on the structure. This book also deals with the collection and concentration of these fluids into commercially possible reservoirs or their fossil trace formed as ore bodies. Chapter one of this book discusses fluid motion and geochemical and tectonic processes. It then defines fluid, discusses the rocks in the surface environment, and provides evidence of the changes of a rock’s position and the motion of fluids. This book also explores the chemistry of natural fluids, including the composition of ocean water; pore water and deep-drill fluids; metamorphic fluids; fluid inclusions; and magmatic fluids. Volatile species in minerals, such as water, carbon and carbon dioxide, chlorine, fluorine, sulfur, oxygen, and nitrogen and other inert gases, are presented in this book. Other chapters in this book cover the solubility of minerals and physical chemistry of their solutions; the metamorphic reactions and processes; buffer systems; rock deformation; crustal conditions; dewatering of crust; and diapirism. The last part of the book discusses fluids, tectonics, and chemical transport. This book will be of great value to mining and oil geologists, as well as to pure geologists. 1.2 What is a fluid? 13.4.6 Shear zones, faults, thrusts, veins, etc.